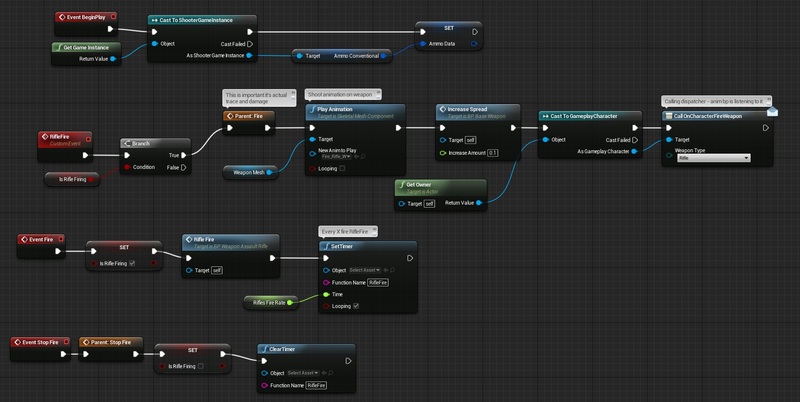 BasicWeapon blueprint now supports a lot but it isn’t supporting automatic fire like assault rifles have. It will be really simple to implement now. Basically I will implement almost all of the weapons from Military Silver Pack and then move forward with gameplay. I want to have BasicWeapon functionalities fully implemented and tested out. For those who haven’t read earlier posts you should implement BasicWeapon blueprint to get this working. So check out earlier posts! Go back to GameplayCharacter and add new custom event: StopFire. And that’s whole rifle functionality 🙂 We are using timer to make automatic fire. It’s really easy. Now in event Initialize Animation we need to know when we are firing and when firing ends. 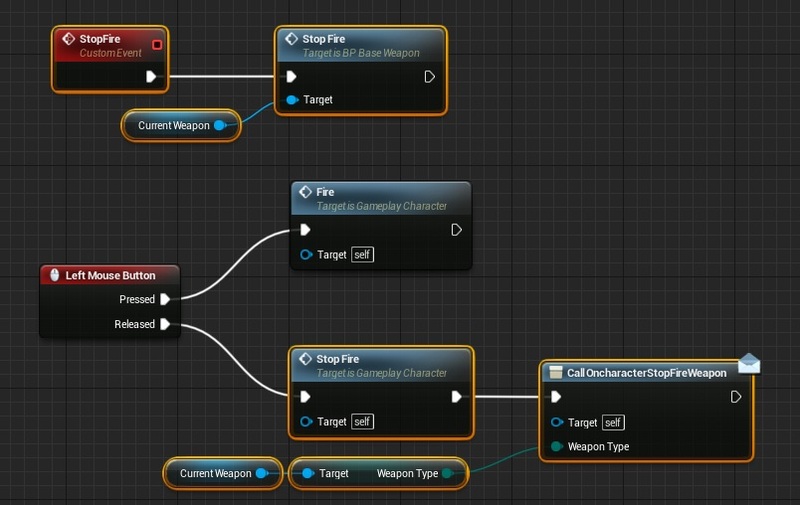 Anim graph should take RifleRecoilAlpha and modify bone. I maybe found a “bug” when you shoot more than your 30 bullet, it continue to fire. OnCharacterStopFireWeapon ? Is it a typing error ? Hi Kendrick, yes you are correct, sorry for the late reply – Should be OnCharacterStopFireWeapon. Follow up question – I have everything working, but is there a way to adjust the blending for the recoil? What I’d want is a super short, sharp, repetitive recoil that happens with each shot. But right now, the gun (I’m using my own) recoils back and basically stays in place until I let go of the mouse. I see it pop forward a little now and then while shooting so recoil functionality is definitely working, just seems like too soft a blend in and out. Nvm – figured it out. To try it out you can follow the tutorial as written, but with name368’s “get player character” fix for 4.10. 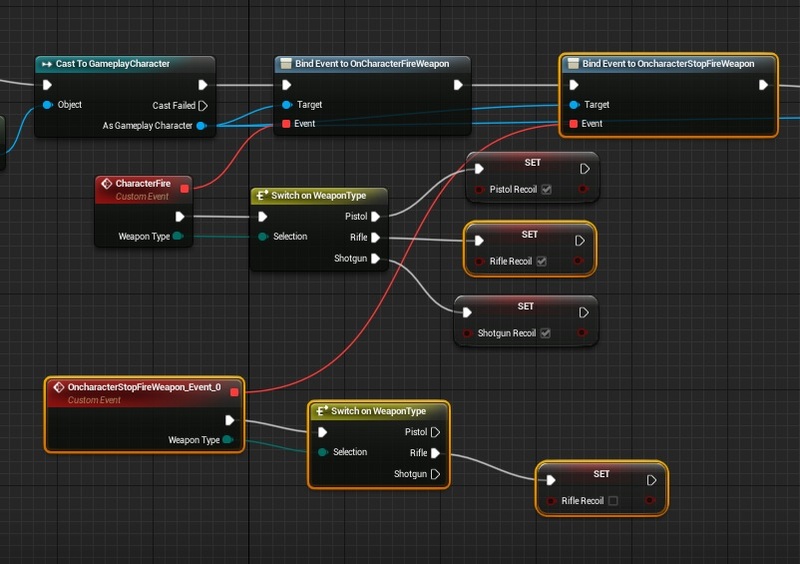 Then either remove the Delay node in the Anim Blueprint branch where you’re handling Rifle Recoil (the section with the FInterpTo Nodes), or set it to a delay duration of 0. I also changed the FinterpTo values to a higher Interp speed (25).